I've thoroughly enjoyed the individual releases in the Haunting of Hastur line of adventures from Dark Naga. Of course, the later ones were written for 5e and I would have had to convert them to run them. 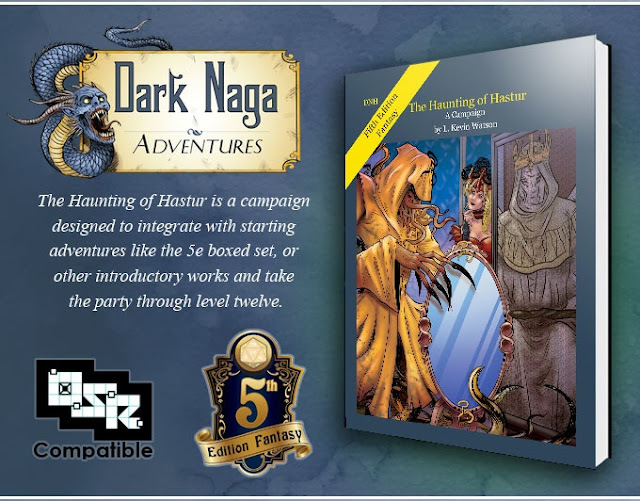 I almost backed the limited print run of the 5 adventures as a bundle in the OSR format but the stars didn't align, so I'm thrilled to see an OSR version as an option with the latest Haunting of Hastur - Hardback - 5e and OSR Kickstarter. This is an omnibus collection of the five released adventures and it comes with Virtual Table Top (VTT) ready maps. Fog of War, here I come! I should mention that Kevin is having the original B&W art colorized for this release. 30 bucks get you the Digital Complete level - everything in PDF, including both OSR and 5e versions. 70 bucks get you the Hardcover print copy in either OSR or 5e, plus everything listed in the Digital Complete backer level. Thanks for the heads up! I've pretty much sworn off Kickstarter, but this is quite tempting. Have the first two books in PDF, but until I can find some peeps interested in playing non-Adventurers League (or Adventures in Middle Earth), I've held off on picking up the rest, much as I enjoy reading them just for myself. BTW, all 5 of the series can be picked up in PDF form right now, in either 5E, OSR, or combined formats. (https://www.rpgnow.com/browse/pub/3865/Fat-Goblin-Games/subcategory/7767_25544/Dark-Naga?affiliate_id=490382) It's just the Pathfinder version that stopped at adventure #2... like many publishers, I'm guessing Dark Naga found the PF pool to have dried up. (Time will tell what kind of pool PF2 will yield, but I'm well clear of both--happily swimming in the 5E pool with occasional dips into the OSR.